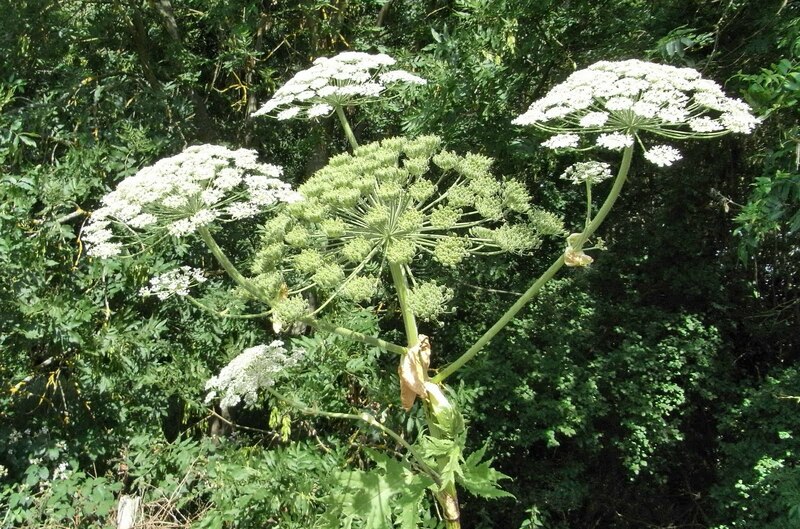 Flower Description: Giant hogweed has broad, flat-topped flower clusters (umbels) of many small white flowers. Each flower cluster may grow to a diameter of 2.5 feet. Leaf Description: The compound leaves of giant hogweed may expand to five feet in breadth. Each leaflet is deeply cut. Stem Description: The stem and stalks are hollow and vary 2 to 4 inches in diameter. Fruit/Seed Description: The flowers produce large elliptic dry fruits marked with brown swollen resin canals. It forms dense canopies outcompeting native species and increasing soil erosion. It exudes a clear watery sap which sensitizes the skin to ultraviolet radiation, resulting in severe burns to the affected area causing blistering and painful dermatitis.